Hello Friends Today I am going to show you how to use a 433MHz RF module in your 8051 Projects. The 433MHz RF module is one of the cheapest ways of wireless communication other than IR that you can use in your 8051 projects.There is receiving and Transmitting module that we will needed. You can easily find them online for3-4$(150-200 Indian Rs). In this particular program, we are using UART to transmit 8-bit data over the RF module. The data pin of the transmit module is connected to the transmit pin of the 8051. When the Switch 4 is pressed on the 8051 Board then the ASCII value of character t is sent over the RFmodule.If this is received at the receiving 8051 then the Buzzer will turn on for 5 Seconds. Click here to download the C, Assembly and Hex file. This article is written by Aditya Wani. Nowadays the number of road accidents increasing frequently. Whenever vehicle accident occurs on the road there may be a high possibility of traffic. In such cases, if we could able to move that accidental vehicle from the road, we can easily avoid the traffic. To make this possible we can build an accidental vehicle lifting robot using the embedded system. You can build its prototype using a small vehicle which you can easily found in the toy store. The working of this project is based on the microcontroller which is connected to a motor to move the accidental vehicle. Also, the microcontroller is connected to a chain based rod to lift the vehicle. The complete circuitry of this project contains microcontroller board which has a robotic platform, keypad, electric motors to move the vehicles and lifting the chain based rod. These motors will be moved accordingly to the instruction given through keys connected to the microcontroller. I hope you liked this project idea. Please like our facebook page and subscribe to our newsletter for upcoming projects. If you have any queries feel free to ask in the comment section below. Have a nice day! Hi friends, in previous article we have seen Zigbee and GPS project which tracks a vehicle. Today we will build another innovative electronic project which will send a SMS from No Signal Area. There are many locations where we get poor range or completely no range. So using this embedded system we can send a SMS from such locations. The only condition we need here is, we should have a mobile network at the receiving end of Zigbee module. This is low cost project and highly innovative. You can build such projects for your final year engineering submissions also. The main objective of this micocontroller project is to send a SMS from No Signal area which is also known as Black Spot area using Zigbee and GSM module. As already stated, this project is useful for creating signal, using GSM module we can send SMS through that signal to destination. In this project we are using two different frequencies. Zigbee has frequency 2.4GHz and GSM has frequency 1800 MHz. Main circuitry of this project contains two embedded development boards. One contain Zigbee and Keypad and other contain Zigbee and GSM. We need to place first board in No signal (Black spot) area. Other development board which contains Zigbee receiver and GSM module is kept in area where there is mobile network. When you type a message using keyboard and hit enter from No signal area, Zigbee transmitter will send a signal with message to the receiver end. Receiver end of Zigbee also has GSM module which will send that SMS to destination mobile. Hi friends, In this project, we are going to make a Vehicle tracking system using 8051 microcontroller and GPS module. You can use this project for you final year submissions which cost you around 2500Rs. This is quite interesting and useful project in our day to day life. We can easily track lost vehicle using this Vehicle tracking GPS module. In this project we are using 8051 microcontroller, GPS module to track the vehicle location. This system will send a location of the vehicle in the form of longitude and latitude values. If you enhance this project you can also easily track the position of the vehicle in the graphical presentation on your PC. The main objective behind developing this project is to track the vehicle position using microcontroller GPS module & Zigbee module along with software to see the track of vehicle on PC. In this project, we using AVL technology. AVL stands for Automatic Vehicle Location. AVL is an advanced method to track and monitor any vehicle which is connected with Vehicle tracking circuit.AVL is a combination of GPS (Global Positioning System) and GIS (Geographic Information System). All data transmission in this project depends on GPS satellite and receiver on the board and Zigbee. There are plenty of tutorials available on the Internet on how to connect Zigbee with your GPS module. Once you integrate Zigbee and GPS connect your circuit with Microcontroller. You can refer this article on how to connect GPS with 8051 microcontroller. For building this Vehicle tracking system you will need Embedded C knowledge, RIDE to write code and ISP to burn the chip. Hi friends, in this project we will see How to automate industrial equipment using Wi-Fi network. We are going to operate electrical equipment from the central control point. This is low cost and flexible mini project which you can use for your final year project. It is also secured industrial automation system. In this automation system, devices to be operated are connected to the Rabbit’s processor. You can see devices like Fan, Heater, and the electric bulb is connected through the Realy circuit. Please read Data sheet of Rabbits Processor for details. The current status (on, off) of the device is sent to the web page which is accessed by the end user. For this, you need a PC which is connected to the Rabbits Processors Wi-Fi network. When the end user sends an action for operating any device, it will be received by Rabbits Processor and get executed. In this way, automation of industrial equipment will take place using Wi-Fi. Hi friends, today we will see how to make temperature indicator using PIC microcontroller. The basic aim of this project is to make you familiar with PIC microcontroller. It also explains how LM35 and 7 segment displays can be interfaced with PIC microcontroller. The following figure shows a circuit diagram of temperature indicator using PIC microcontroller. In this mini project, we have used PIC microcontroller and a four digit seven segment display is interfaced with it. For sensing the surrounding temperature we have used a temperature sensing IC i.e. LM35. You can use a voltmeter to crosscheck whether the indicator giving correct output or not. The output of the temperature in terms of volts will be in the range of mV. LM35 is an integrated temperature sensor. It produces an output voltage proportional to the temperature. The advantage of using LM35 is that it does not require any external calibration technique and it has an accuracy of ±0.4 degree Celsius at room temperature. It draws the only 60µA from supply and possesses low self-heating. Thus the chances of error get minimized. Click here to download the project content. It consists of C program, Proteus design, HEX file for PIC microcontroller and circuit diagram. 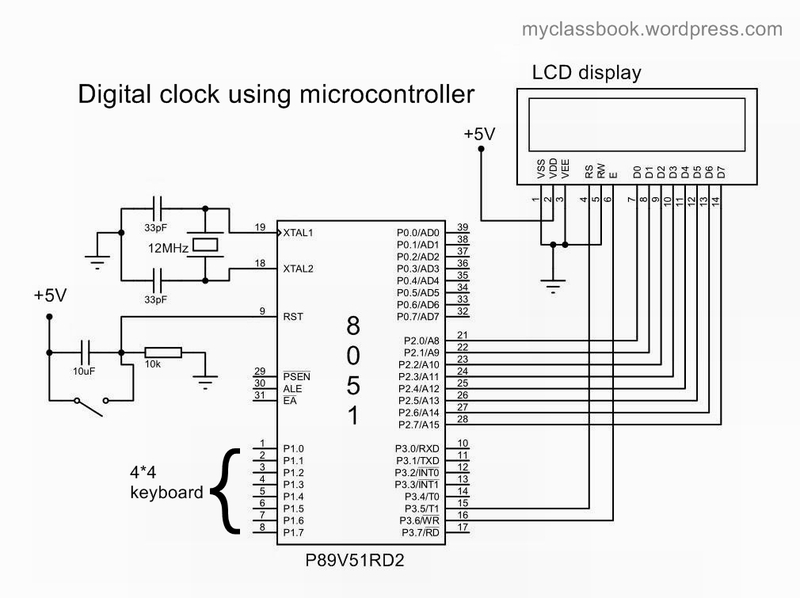 Hello friends, today we are going to make a simple digital clock using 8051 microcontrollers which you can make as your engineering mini-project. In this mini project, we are using one 8051 families based microcontroller, one 16×2 LCD display and one 4×4 keyboard for settling the time. Connect the 4×4 keypad with port 1 of the microcontroller. Connect 16×2 LCD display with port 2 of the microcontroller (make sure that all the data pins of LCD display are connected to the microcontroller correctly). 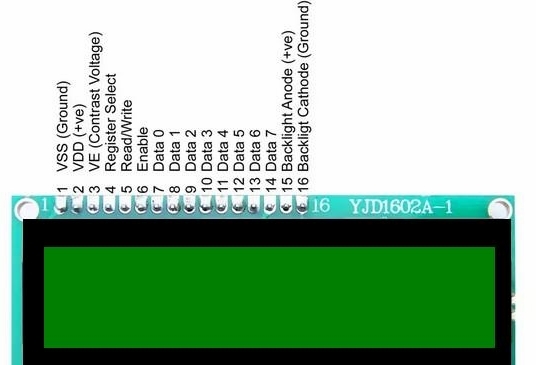 The rs (register set) pin of LCD is connected to pin 3.5 (pin number: 15) and en (enable) pin is connected to pin 3.6 (pin number 16) of the microcontroller. Connect crystal to pin 18 and 19 of the microcontroller. We are using 12MHz frequency Crystal. For reset, circuitry connects a pushbutton to pin 9 of the microcontroller. We can also use a potentiometer to adjust the contrast of LCD. Click here to download C program and HEX file for this mini project. Fire alarm circuit using IC 555 – Mini Project. Digital Thermometer using 8051 microcontroller – mini project. 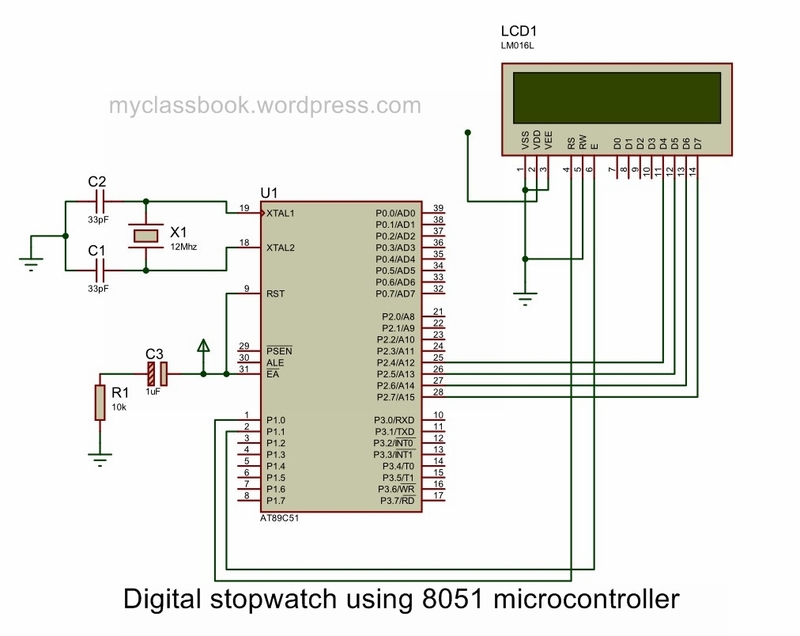 Today we are going to make a simple mini-project using 8051 microcontrollers. A digital thermometer using 8051 microcontrollers. A thermometer is a device that measures temperature or temperature gradient using a variety of different principles. 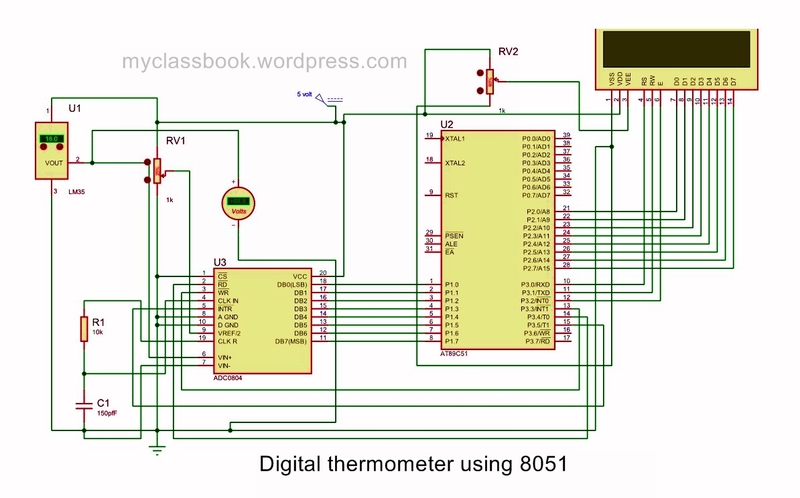 Let us see how to make Digital Thermometer using 8051 microcontrollers. The output of digital thermometer is in Celsius scale. To display the output i.e. the temperature we have used a 16*2 LCD display. 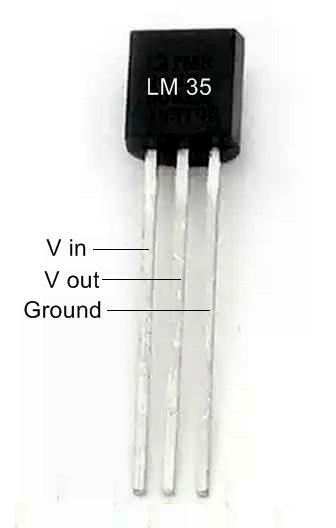 LM 35 is temperature sensor IC which is used to sense the temperature. Normally LM35 generates a 10mV change in output voltage per degree celsius change in temperature. This temperature is then converted into Celcius scale using analog to digital converter i.e. ADC0804. The accuracy of LM35 is +-0.5 degree celsius. Its temperature range is from -55 to 150-degree celsius. Thermometers are used in a wide variety of scientific and engineering applications, especially measurement systems. Digital thermometers can be used in roadways in cold weather climates to check if icing condition exists or not. Click here to download C program and Proteus simulation files.